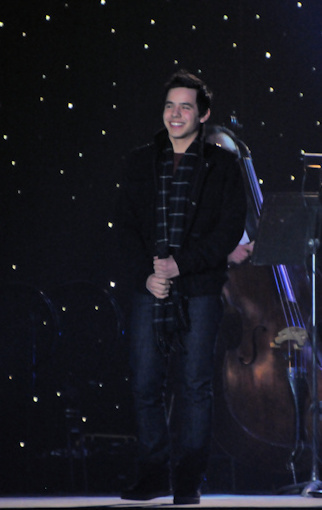 « David Archuleta at Stadium of Fire Tonight!!! 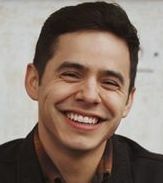 This entry was posted on Friday, July 8, 2011 at 3:28 AM	and is filed under career longevity, David Archuleta, genres, Personal freedom, song writing. 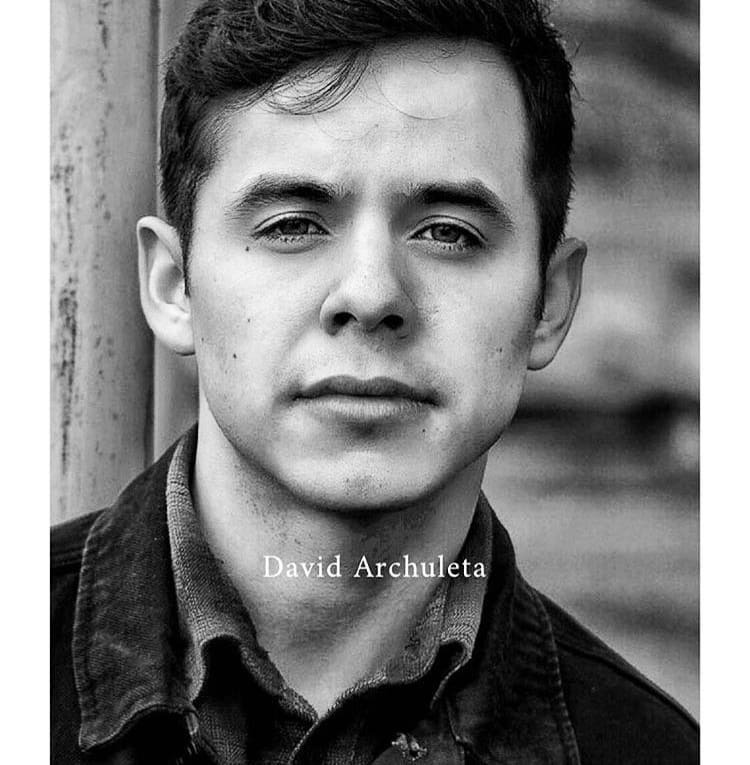 Tagged: artist/singer/songwriter, claim to fame, David Archuleta, mad vocals, original, the Voice, versatile. You can follow any responses to this entry through the RSS 2.0 feed. You can leave a response, or trackback from your own site. Bebe, terriffic article! I love the comparisons and the title is perfect. I’m waiting for that smash hit too, the one that opens the door to his future, one that allows everyone to hear what we hear. David already holds many of those keys to success. I think he’s smart to take this time and try to make sure that he opens the right door. 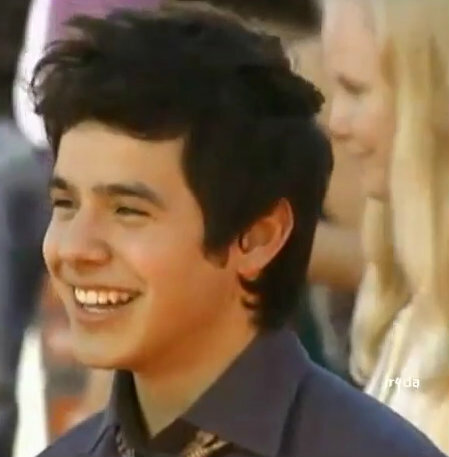 Lately I have been thinking about David and his decision not to rush his career. I know that some fans think that it is a big mistake and that he will lose fans. I was concerned too but then I got to thinking, many of the decisions that we make between 18 and 25 still affect our lives today. During this time we become different people but have to pay for those decisions in the long run. I know I have. I got married when I was 18. I wish that I had waited to start a family. I had my son at age 19. I wasn’t ready to deal with a new baby much less a hyperactive child. It all worked out but if I knew then what I knew later, I would have given it more thought. David is so smart and wise to realize this now. Also, he doesn’t want to be distracted by sustaining a girl friend relationship. If it happens then it happens but his focus is not on that right now. Of course we both know that David prays for guidance and obviously he listens and steers his course in the direction he is meant to go. It’s wrong for us to doubt God. So, I am trying to be patient and “go with the flow”. This is a most enjoyable article, as you have stood back and had a look at who David truly is and where he honorably resides in the world of music. For a long time now in my own thoughts I have included David as being one of the classic singers such as the Beatles, Elvis, MJ, Frank Sinatra and Andrea Bocelli naming only a few. Whether he has a smash hit or not, he will find the way to become one of the greats that will be with us forever. I think that he has his foot in the door and the release of the MoTab choir CD and DVD will reinforce that to many more, as no one on the music scene can compare to him. Correction, “I believe that he has his foot in the door”. I never use ‘think’ when I am writing about David. Bebe – really great article! The world today is in such a hurry for everything so your words remind us that patience is a virtue and in the end it does pay off. David teaches us so much and his insight is amazing for one so young – heck, for anyone at any age! I’m with Suzy-Q – so many decisions we make before the age of 25 do affect us for our whole lives. Thank You for your research and article. Thank You for the beautiful picture Angelica. David is indeed a star in my book and will survive the test of time. I’m so proud of him for his decisions and being more concerned with his artistry and being authentic. Whether he has a smash hit or not he will have quality without measure. I’m so thrilled with his performances with MOTAB and his recent shows @MB and SOF. I can’t wait until his release of the MOTAB Christmas CD,DVD and PBS special and his Asia trip/release of new music……and whatever US gigs we can get!!!!!! I used to want him to rush for my benifit(because of my age)but now am quite pleased to go with the flow. Next up……….God Bless America……….and God bless us all. Love the article Bebe, so beautifully written and I am right there with you. “How many other artists sound like David? I cannot even name one”. What knocks me off my feet is this. The rate of speed that David has progressed already since Idol have been mind boggling to witness.How many times have we said hes like a sponge? He already has the keys to become an artist, the likes of which we have never seen in our lifetime.We have seen it and felt it and we wait in excited anticipation of others discovering the phenom he truly is. And besides that ,hes the best looking little sponge I have ever seen. Not a tweeter but The VoiceDA’s tweet about the Baseball appearance was Rt’d by Shelly and then RT’s by David. Thanks DJfan for your behind the scenes work. A bit of trivia FYI ha! 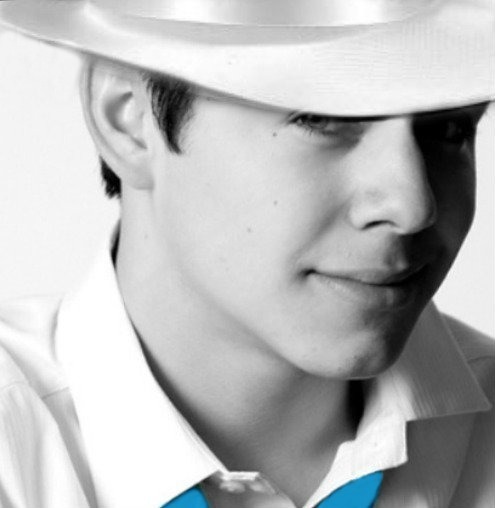 I cannot imagine a world without David’s music. He may not realize how immense his talent is, but I think he does feel a responsibility towards his fans. It seems sharing his gift with us is important to him. It is a gift he wants to give. Surely he must understand by now what a difference he makes in many lives. Going back to my life before David is not appealing to me. I remember when Frank Sinatra was young and all the rage. His fans were swooning on camera. Then there was a time when he faded from glory and had no career. Yet he was constantly improving his craft, finding new singing techniques. Other singers were amazed at what he could do. Songwriters wrote songs for him. He persevered and became a much larger icon in the music business than he had been in his youth. For many of us David has become as solid a musician as all those listed by Bebe. I’m not sure how to phrase it, but they have “legs”. Maybe the foundation that David was talking about. With such a solid core, there will always be a fruitful result. I appreciate the replies! Thank you! This was such a fun article to write but also one that I needed to write. David has become a huge part of our daily lives; we want to hear his voice every day; we NEED to hear his voice every day. But it’s easy to forget that he’s young and needs to follow his own path, not the path we choose for him. Success doesn’t happen overnight.We must be patient and let him grow to be all that HE needs and wants to be. A talent like his must be treated with respect. He is already moving mountains. Imagine what he will be like after a long career. Imagine how many lives will be touched by him. “I think he’s smart to take this time and try to make sure that he opens the right door.” ITA, MT. I admire his courage, his determination, his steel will! “I got to thinking, many of the decisions that we make between 18 and 25 still affect our lives today. During this time we become different people but have to pay for those decisions in the long run.” You’re very wise, Suzy-Q. The old adage ‘Youth is wasted on the young’ is not true in David’s case. Can’t wait for the MoTab cd/dvd release! Those of us who didn’t make MoTab will finally see what you all witnessed! The few precious ninja videos were so appreciated and kept us going but it’s time for the real thing! “The world today is in such a hurry for everything so your words remind us that patience is a virtue and in the end it does pay off.” Patience is hard but in this case especially, so worth it! David is very wise for someone so young. We saw it on Idol when he took what he needed from the advice given him and discarded the rest. He’s still doing that now by establishing his priorities and sticking to them. I don’t think most people of his age are as conscientious. “With such a solid core, there will always be a fruitful result.” Very well said! Thanks for the info on Sinatra. I was never a fan but always enjoy reading about him. David retweeted us!!! Shelley tweeted us, then David retweeted that tweet!!!! I just got back from errands, and it is 103 right now. at least by the time the seventh inning rolls around tomorrow, it will probably be a cooler 100? or 99? ACK! It is insufferably hot. Just feel bad for all the stars who will be out for this charitable event to have to play in this weather. Knowing David, he will be cheering them all on before he sings GBA. The game should be alot of fun. David, you should come sit right here .by me and watch.we can share my little battery run fan. :) and drink lots of water. I enjoyed reading about the elements of longevity. Bebe it looks like you covered all the critical areas that an artist must learn and practice to maintain a career. The accompanying image created by Angleica speaks to the fact that David, himself, holds the key to his success! I have no doubts or reservations about David or his longevity. His strengths are versatility and originality. He can sing any song and make it sound like the very first time I have ever heard it. Lovely read Bebereader! I very much like the way you emphasized the USP’s of the different artists that are in small or large part, already in David’s arsenal ;). Although many are realizing that David may not be or may not like to be the mega star in the Hollywood mold, like you, I also wish that he gets a mega hit — if only for a wider & deeper audience to discover his enormous talent. David is amazing where he is at now. But imagine as he matures, falls in love, acquires more life experiences? The possibilities are most exciting, right? Heaven help us, LOL! I’ve really enjoyed reading your article and how you spelled out the keys to David’s longevity in music and how you highlighted the elements he already has. Who right now at this age has them? JObros? Fetus? Gomez? Swift? None in my opinion. 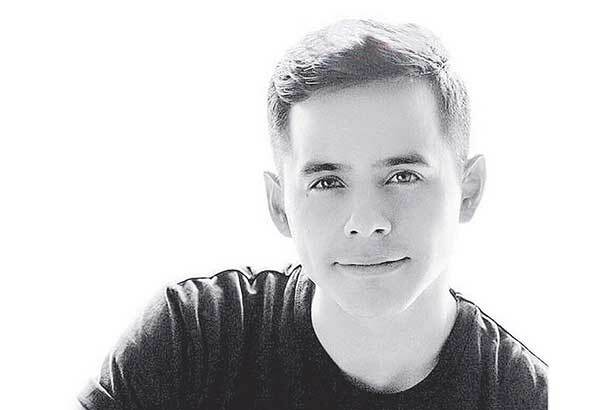 Some criticize David for taking the easy road when he has actually taken the road less traveled, proving that he is a courage’s risk taker by having faith and following his gut just like those he’s mentioned in the video above and the one’s Bebe has included. Angelica, That is one beautiful piece of art. SB, I believe that the Motab CD, DVD and TV broadcast is all going to be a huge win win for David. Heidijoy, I have a condition, ODD lol I couldn’t believe the tweets we were getting. Can you believe what crazy me did? I retweeted every single retweet of the tweet David retweeted haha. DJfan Ah yes tweet and retweet and retweet some more. You go girl!! The official site was in on the action too!! Love what you have to say in this article! If I might add 2 more artists to the list…James Taylor – still touring 6 months a year to sold out shows around the globe (just this past weekend gave 4 sold-out shows at Tanglewood with 20,000 capacity per show). His songs are classics and he has taken great care to maintain his voice which sounds almost as good as when he released his first album. In recent years James has partnered with the Boston Symphony and has forged ties with artists in Nashville. Another artist that has relevance to David is Phil Collins. He also had a blockbuster career using his unique voice to marry pop and rock. I think David could totally pull off this style of music. Phil also had a decent acting career (actually started off as a child actor). Thanks for all of your research and thoughtful article! Thanks to you, too, Angelica for your thoughts on the striped shirt. You ladies rock! bebe, cannot even tell you how much I love this article. He has all the tools to build a solid, long lasting career. And now without interference from label or management, he can draft his own blueprint. 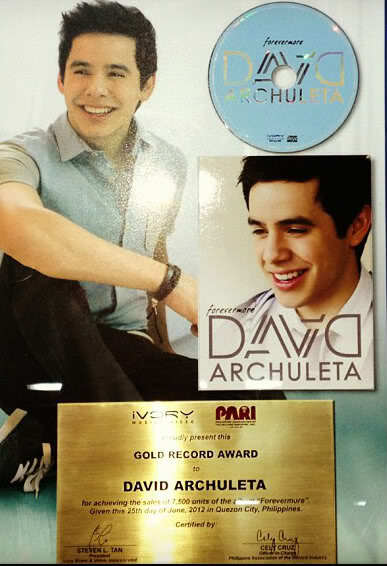 As abrra said, he holds the key to what will someday be David’s monument to music. Great article, Bebe. 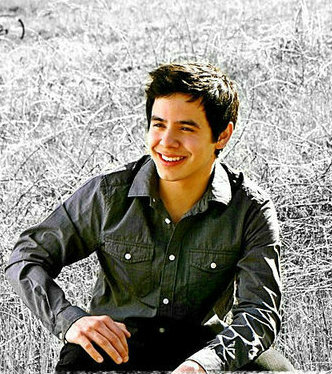 I have always trusted the Archuleta on doing and being what he wants. Evidently Jive was holding him back, but he’s on a roll now because he is doing what he wants and how he wants. Glad that he has his fans backing him while he’s taking his chances. I know he might not even took those chances if it wasn’t for us fans. I think, eventually, he will be as big as any of those you mentioned in the article. Even if he isn’t, he will be happy because he has done things the way he wanted with the blessings of his fans. He’s so in to charities and helping others, that’s what makes him happy. When he’s happy, we’re happy! Hoping to get a place for meet and greet on the 17 July . Safe travels, Vee! And good luck on your meet and greet! are more out there but I chose a random sampling. I didn’t realize that Phil Collins started out as a child actor. Emmegirl, He has all the tools and he’s using them. Not a lazy bone in that boy’s body. Jan, Thanks for your comment. “I think, eventually, he will be as big as any of those you mentioned in the article.” I like knowing that we are here at the very beginning of his career to cheer him on. We the Kings has a new album out #SunshineStateOfMind. Check it out! Sky, when was the last time you saw David? I so agree with your addition of James Taylor and Phil Collins to the list of artists who have longevity. I also agree that David could rock some Phil Collins stuff. Love him. Love the article and how you bring out all the keys needed for a long and successful career as evidenced by those who have used them. I know David has most of these on his key ring already too, just needs to find the right door and it will all open to him. The mega hit will happen one day and it won’t be just one. Thanks for this…”David wants to discover his own sound, away from the pressures of anyone telling him how he should sound.” That is the master key and he’s smart enough to know it and brave enough to pursue, against all odds. hmmm… That would be a great one for David to cover. 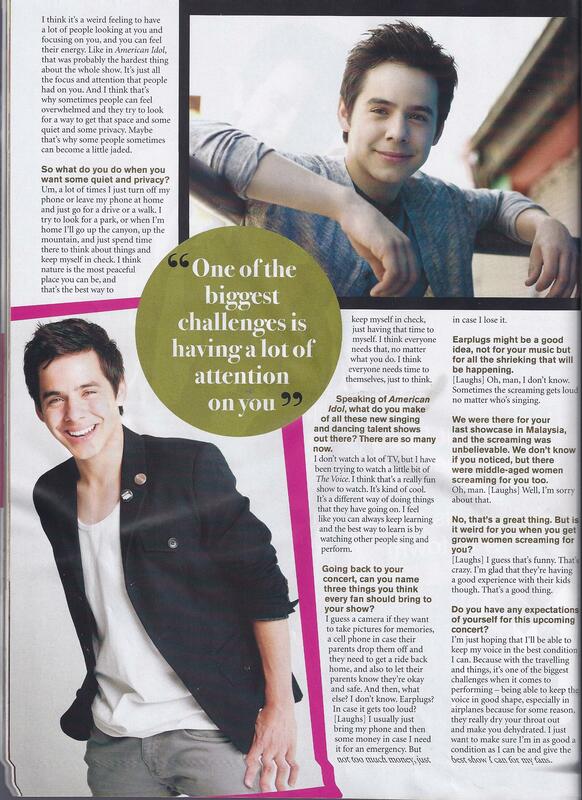 Bebe, love, love love this article! I love this sentence. There is some kind of magic working in him. In addition to all the other stuff. His work ethic. His knowledge that family life is more important than business life. His songwriting. His need to help those less fortunate. (how many artists have a charity tab on their Official websites? All of this leads to longevity. David tweets! The human sponge is at another concert soaking it up. Brings me to remember another great article you researched and wrote, Bebe. Now that has set me off on a CFTH video spree. Oh yeah, he already did cover Phil Collins. He doesn’t just cover. He smothers. gaaah. Betsy, “There is some kind of magic working in him.” << True words! David was at a Five For Fighting concert?!!! I knew FFF was on tour. In fact just last night I was watching some videos from their current tour. I believe YJ posted them. I like most of their songs but my favorite of all time is The Riddle. But I was so disappointed. It was a really bad performance of the song. In fact I can no longer listen to FFF sing their own song. 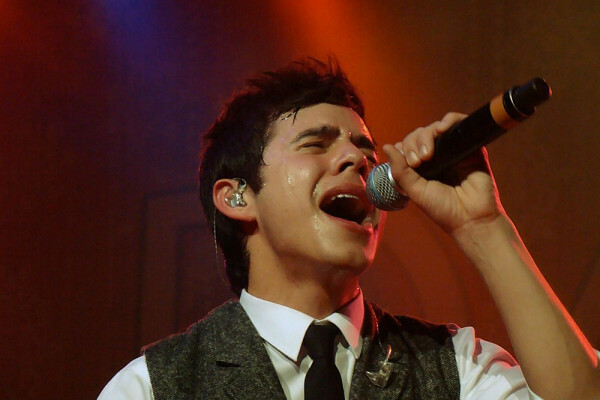 I immediately switched to David's Waukegan Riddle from the Christmas Tour and was…healed. 26. Djafan,the last time I saw David was December 3rd for the “blue jacket” concert in Dallas! HA! Getting things ready now, camera, and iphone charged, and trying to decide what to wear that is lightweight enough in this heat later, and get ready for work too. It was 106 here at the DFW airport yesterday at 5pm.Hope David has fun today while he is here,and stays cool. Looks like Ishould be in Frisco (Dr.Pepper Ballpark) by 5pm. as a Phil Collins song says “I can feel it coming in the air tonite….oh Lord ♫Love the song, just can’t think if it at the moment. I love that one, would love a cover of that..
Sky, have fuuun! So glad you finagled a way to go, we’ll be waitin’ for the scoop! Have a great time and stay as cool as you can! 106 degrees!!! 😯 We’ll be waiting up for video of his performance to surface and hopefully you will surface too and tell us all about it tonight in unplugged? Since you mentioned that Phil Collins song (and since Abrra is not around, I can continue my spamming of this thread with him). hee hee. 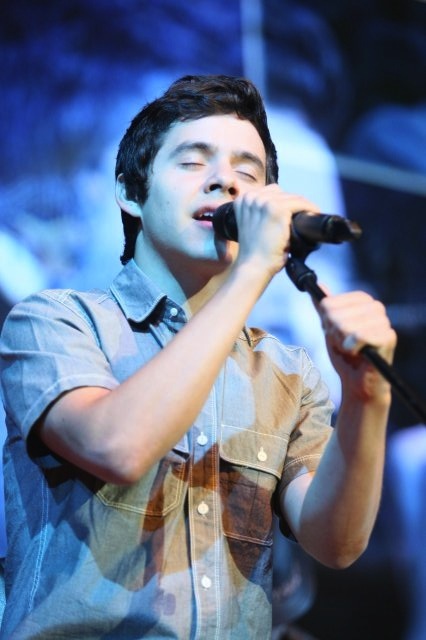 The song is “In the Air Tonight” and if David eevverrrr covered it, it would bring me to my knees! That song was almost a spiritual experience for me when it came out. Oh Lord! I have been busy the past 2 days. But I do get time to check in on Miss Angelica! Off for the day now to a family gathering where I hope they have names tags. LOL Too many generations to keep them all straight. Angelica, haha….This mouse loves Phil Collins and I would absolutely die if he covered “In The Air Tonight” one of my all time favs. Just came in from working in the yard, it’s hot here and I’m dripping wet in just a half hour of time. Cooling off in front of a fan and catching up at The Voice. Bebe, great post. David definitely has what it takes to have a long career. He just shines with that “it” factor. I’m having the time of my life watching and waiting for everything his little heart tells him to do. I trust his judgement completely, even if he makes a wrong turn here and there. He’s on the road to big things. I just feel it! Can’t wait for September 17th! 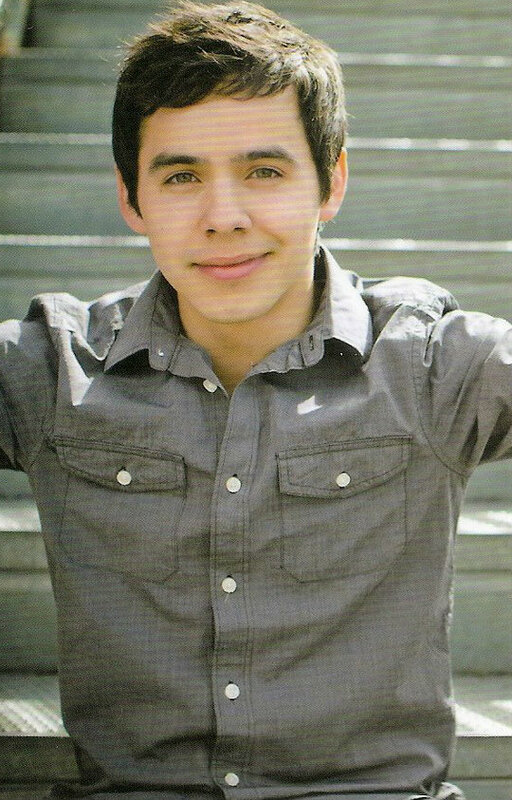 David will be here and I see that many fans are coming to Gilbert, AZ. Let’s Party!!!! “He just shines with that “it” factor.” He does, even in a vlog. Several things I love about that vlog. 3. Such a cutie patootie. Love that gorgeous face. 5. So supportive of his friends. B-B-B-BEbe–Thanks for the article–I will never til my dying day understand (after that I will) why some “get” this and understand it and others are still in the dark. I’m so thankful to be on the “get” list. I’m also thankful that David has the built in inner ( Be Still My Soul ) patience and is smart enough to march to the beat of his own drum. Be it one person at a time –or a whole arena full of people at a time –he will open those doors to a life time of doing what he loves. Is there a difference between the meaning of the the terms “sound” and “style” or do they mean the same thing? Can someone with more gray matter or musical knowledge explain? Bebe, This is a great post! Love this: “One might say that he is reinventing himself. 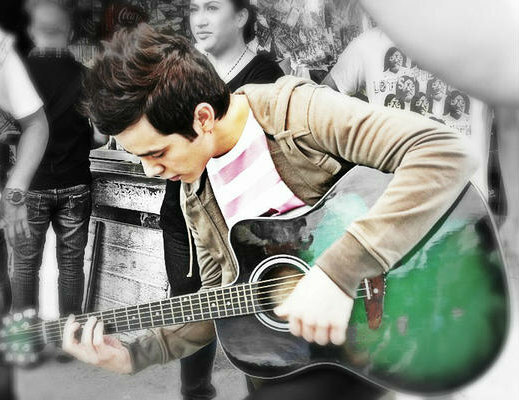 In a short time, we’ve seen changes in his performances that lean toward his goal of becoming the artist he envisions. He is owning the stage. He is relaxed and in charge. He shows the sensuality of someone twice his age, one of his trademarks.” Yes! That sensuality just oozes in recent performances! 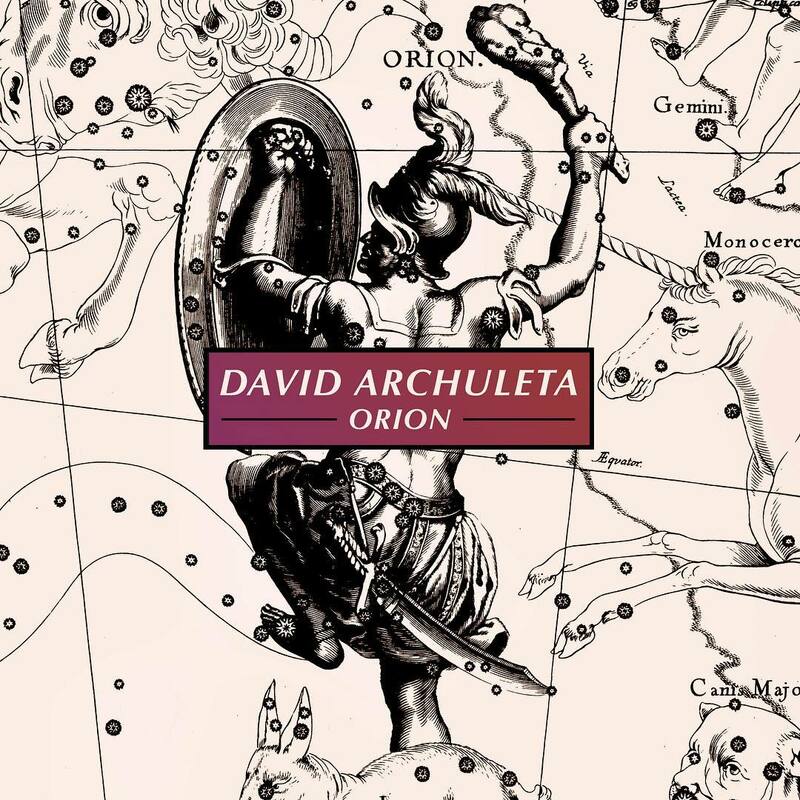 Then this: “David’s voice is unique; it is original.” Yes! Yes! There certainly is no other VOICE that can even begin to compare! Love this vlog. Love the lighting! Does his eyes look blue to anyone else? It must be all that beautiful blue that surrounds him. He just does good things to my heart! 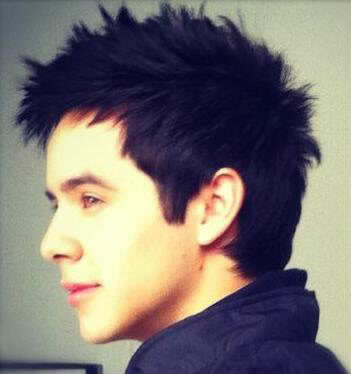 I just love Davids blogs he is so good looking and those eyes,amazing !! U cant help but smile watching him. His smile is cantageous !! I just adore him. I FINALLY HAVE MY INTERNET CONNECTION BAAAAAAAACK!!!! The video of Beyonce David spoke about in his vlog above. I remember him saying once that her concert was the best he had ever seen. Off to Itunes to get the Civil Wars album for $5.00!! Been meaning to get it and this is a great time, ya think? He is wise and adorable and my face hurts from smiling. Wowoza! 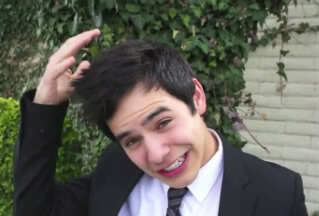 Loved the Video blog of David. Djafan Happy for you ! It’s really frustrating when one’s internet is down. awww – Abrra – they are adorable! Thanks for sharing your special day with us! Abrra, Wow, that’s a lot of babies, and so many boys!! Sounds like my family, hardy any girls. lol And they’re all so beautiful! So happy for all of you that her granson came home safely. abs, thanks for sharing that joyous photo, beautiful family. Hi everyone! I tweeted about David’s blue eyes after watching some videos from the Stadium of Fire so it’s good to know it wasn’t my imagination! Never noticed it until recently..always thought they were a shade of hazel/green. Whatever shade…beautiful & mesmerizing for sure! It’s been a busy Saturday and barely had time to check in! PattiNC, You’re right! 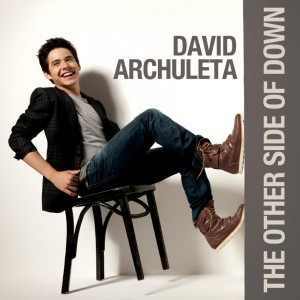 Some artists are missing that somethin’ somethin’ but David has it in spades! Dak, “Surprise—-I’m confused. 😉 Is there a difference between the meaning of the the terms “sound” and “style” or do they mean the same thing? Can someone with more gray matter or musical knowledge explain? Idk if I have any more gray matter than the next person but I think when discussing music, it’s safe to say that ‘sound’ and ‘style’ are very similar things. Archangel48, “I’m along for the ride…It’s been somethin’ else so far! :wink:” We’re right beside you on the ride! I started watching Beyonce’s video but had to stop to finish later. I have a feeling David wants us to watch it so that we understand how he’s feeling now, doing it all on his own without a label. David is in one of the suites. He came out for the national anthem. Aww. We saw David and took a few pics. He was in one of the dugouts. GBA was awesomeage. I am still shaking. Yvette’s tweets: (she was at the game tonight! GUYS I JUST SAW DAVID FREAKING ARCHULETA. HE WAS LIKE ONE FOOT AWAY FROM ME AND I SHOOK HIS HAND. YES I WAS THAT CLOSE. I TOOK A PICTURE WITH HIM!!! MY LIFE IS COMPLETE!! And that’s just another day in the life of a fan of The Voice! Bebe, lol Sounds like someone is excited! Meeting david up close and personal like that must be kinda like walking into a fairy tale. Lucky girl! I wonder where SKY is? Hope she made it and is having a great time … and gets to meet david!! Bebe—Thanks that’s pretty much what I thought, but ya never know in music lingo –there could be a difference. After reading Yvettes tweets and seeing those –THUD– pictures you can put up the happy dance for all of us!! Abs–beautiful children—I’ll bet that it was fun just to sit back and watch them. #51, Ab, they are all so precious! Skydancer1x video of GBA from tonight! I put it on youtube for her. MP3 from the above video is in the Candy jar! Abrra, those babies are precious! I bet they had a great time playing together. Sky, amazing audio on your video. The last part is almost too beautiful. I found myself applauding him. Never done that to a video performance. Just superb vocal power and control and the way he gets creative with the melody without departing from the traditional essence of the song at all. Dat boi is a genius. Beautiful audio on your video, Sky! Thanks for braving the heat for the fandom! Can’t wait to hear more of the story! Here’s one more video but it’s only 25 seconds! That voice! It grabs you and pull you right in. When he sings the words “land” and “love” in the second sentence of GBA…wow. Beautiful performance as always, David. Good Morning everyone & a lovely Sunday morning to you all. 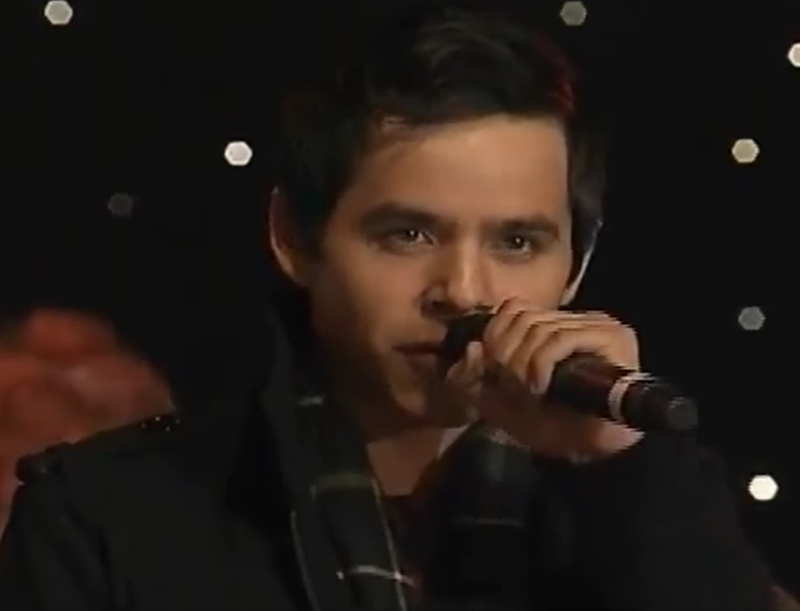 Oh my goodness..David’s God Bless America was out of this world & the crowd obviously loved it. Let’s face it..NO ONE sings it like he does. Let’s get David in the top 5 vote getters! He’s never fallen below Kelly, Carrie, David C & Adam! Voting ends tonite! Clear your cookies! Is it weird for you when you get grown women screaming for you? Note to self: Find some kids to take with me to the next David concert so screaming looks normal…. Morning Voice peeps, and happy Sunday. Good article Bebe…so much thought provoking on this topic, I suspect it will be one the fans will continue to discuss about David. Ya know…I think…”clever marketing people and savvy promoters” make money, not artists. I realize it’s a necessary part of the business end…but maybe it’s since we’ve become such a “branded” world, that it’s all gotten unbalanced…with art giving way to manufactured talent and fame. And fame…that’s hardly a noble goal (or a prize!) vs. the goals David has for himself. We’ve all known from the beginning, David is a true artist. Music is his passion and an extension of who he is, and he’d have to be true to what feels right to him in that. He just HAS to do music he LOVES! Period! I believe he’d sooner walk away than sell out or not do the music he wants to do. It makes sense he’d make any moves he had to, early on, to find his way to that. AI and Jive was his launching platform…and he did what he had to do, and got what he could from it, and instinctively knew when he needed to move fwd. 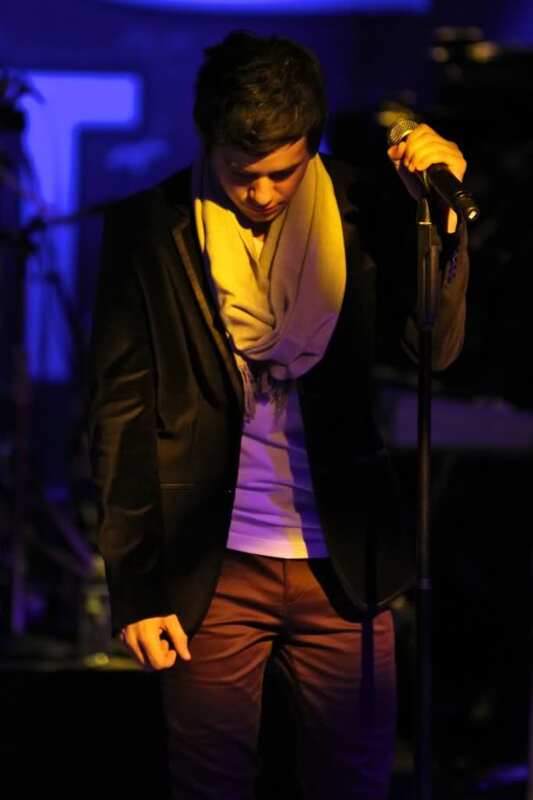 I continue to trust him completely, and his following his musical instincts and being true to himself. I love and applaud the joy of freedom I see in him lately. It’s been such a fun ride to be a fan since day one and have followed this natural progression and it feels like now we’re getting to a place we all kind of envisioned would eventually happen..
I’m ecstatic myself to see what’s to come! David’s in good hands, his own. meantime Excellence will always rise to the top and last over time…real talent, great music, lyrics, and all the elements that make up the great talents you write about here… You can’t “make it up”…but when it shows up for real, it can’t be denied. You make a lot of good points here, Bebe. I don’t listen to pop music at all, but I am familiar with these artists, their distinctive voices, and their ‘sounds’, so obviously, they have that extra something which has permitted them to reach people outside their genre. I think you nailed it with “They took risks in their songwriting and performances and stayed original and versatile.” I’m so glad David escaped what must have been a truly suffocating experience with Jive, a company that doesn’t value or encourage originality and versatility. Can I get an intervention? I need help out of a vortex! I am stuck, stuck, stuck on Falling Stars from Good Things(?) Utah, which is surprising because FS was one of my least favorite tracks on TOSOD. Eman seems incapable of writing anything without either a clap track or the dreaded word, ‘baby’, so I tend to skip his songs. But have mercy, David should have recorded FS with just the piano; his voice completes the production. That was beyond beautiful. That GBA..his voice just envelopes like this beautiful fog that drifts in and you can’t see or hear anything outside of him. gaaah! Amb4d, love your post, especially the entire fourth paragraph. But I think good marketing and promoting is essential – with the goal not necessarily to become a superstar, but just to stay afloat financially. Read an article in out local paper today about Amazon paying millions to Lady Gaga’s label to offer her entire album for 99 cents – in the end they lost 3 million dollars – many are not even willing to pay 99 cents for LG’s album when they can download for free. It went on to say how artists make little or nothing on albums but can make some money touring, or atleast tread water. Chart topping artists get their cash from lucrative merchandising and endorsement deals with big promoters. When I look at David and see how hard he works making his music for us, the sacrifices he makes to do this, beside the fact that he lives his life in a fishbowl, I feel he deserves a decent financial payoff. Not talking “money to burn” wealth, but able to comfortably support a family and work when he wants and be home when he wants. It seems that you have to take advantage of every single resource available just to survive, much less thrive. I have not one ounce of doubt that he will have a long-lived career. He is not a clone, but an original. David has moved up to #6 so let’s get him into the #5 spot to make the next round! Chat was great last night until I fell asleep and woke up to a wiped screen lol. Yvette was tweet sharing yesterday, here’s her fun recap and a couple more pictures from her. She is supposed to be uploading some video of all this, so I’ll be on the look out. lct, I’ve only been able to vote once even after clearing cookies. Please vote everyone, ends today. Xaris, “Is it weird for you when you get grown women screaming for you? Haha Thanks for bringing that interview here! I don’t think David is clueless, do you? I don’t bring kids with me either when I go to his shows. I think he’s just being sweet. I happen to love the ‘clap track’ you refer to in the back of the song. As the beat builds, so does the intensity and it builds to an outpouring of emotion for a love affair that is over. Although I love the sound of David’s pure voice in any song, I think in the case of FS, the music only enhances the mood of the song. It’s my favorite track on TOSOD. I’ll take it scrambled, fried and any way I can get it, even with no music at all. We are only 26 votes from taking the #5 spot so lets do it! Hi all! so happy to see all these pictures from yesterday! As you can see, he was his usual, always gorgeous, self. I think I will begin with my search for David once we got to the game.My poor daughter.. Once I was sastified we had “swept” the area, and she was pleading to go to our seats, we purchased our 2 bottles of water and a bag of peanuts to take”‘our place in the sun.” Great seats, they were all good seats. Sun was at our back, so no looking into the sun for anyone. My first sighting of David, came from the blue teams dugout.opposite side of where I was sitting, by the white teams dugout. I first spotted that black head of hair through the blue team members legs,as they stood lined up in front of the dugout. (me as I left my seat to fly up the stairs) I THINK I SEE HIM BEHIND THOSE PLAYERS!! and headed over that direction.but could not get near enough to get a pic, but did see him for a second, smiling, looking so cute in that white baseball shirt. gotta be in the right place at the right time dang it. At the top of the fifth I was thinking, soon David. Then all of a sudden, the servicemen were taking the field. Then David walks out and started to sing GBA. what? now? unannounced, before the 7th inning stretch?So I ran down 5 rows to the front, up against the fence,and shot what I could from where he was. That voice of his just soared. It permeated the building, and it was loud proud and strong, as you hear in Abbra’s mp3 she so kindly made from my video.He just melts me with that voice. It is so rich, and his way of singing them just makes me want to cry with love and hope and pride for my country. The military loves David and I know they respect the way he handles our National Anthem and all patriotic songs with such love and care. 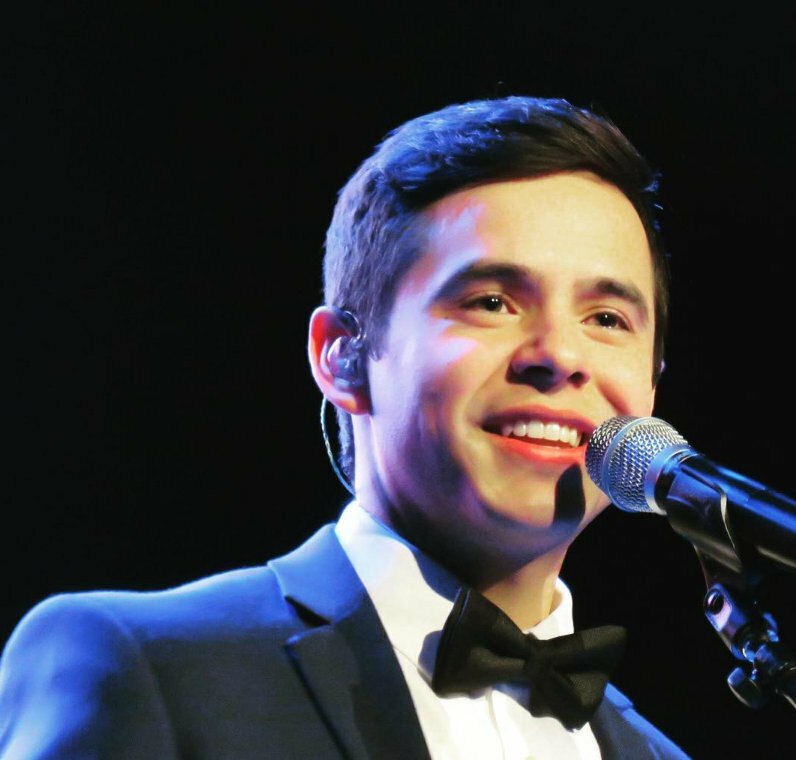 Bob Hope would have loved David Archuleta. Obviously , I am not good at videos, especially through a fence.new at that too.and then I tried to put my hand across my chest ,on my heart. I know you can’t see him but from a distance. :( but I love how good the audio came out) thank goodness. after he sang, another surprise as he came across the field towards the other dugout! He was coming right towards us, so this time, I jumped back up, went to the fence and yelled and waved! “Hi David, you were so great!” He looked right at and smiled at me and waved back! Made it fast this time,I was the only one standing right there in that good place at that moment..Then he came up to the fence, beside me was a little girl who wanted a quickpic with David, so he bent down to her, and obliged. That was the closeup I wanted, and he was close! as you see.I said bye David, and he moved on further down. Thanks for the review of your experience. Glad you survived and it sounds like prospered. Saw/heard your video last eve right about the time I was going to give up after spending hours reading tweets and seeing twitpics @ Fanscene. Thanks so much for your efforts. I wondered why they decided to have David sing @ the top of the 5th instead of 7th as advertised but it sound like everyone was respectful and standing in place on the spur of the moment. Don’t know if you met Yvette but her review is on Fanscene. She was a hoot throughout the evening. Skydancer………That message was for you!!! Bebe, Falling Stars has become my favorite too, especially in performance. Lct, like Archangel48, it would only let me vote once. Skyyyyyy 🙂 Thanks for the great recap (I could picture the whole thing ♥ ) and that awesome video. I had to laugh at the Bobble-Head comment. And of course, goofy me, I found myself imitating what I thought you were doing. Hahahha Too funny! Thanks again for the recap, the video, and for the laugh. All right David is 4 votes shy of being in 4th place! 🙂 For those of you who have not voted please do so! #86 Thanks, Sky for a great recap! I could just see you trying to keep up with him! He’s worth it!!! Good job! sky, thanks for the video, the audio is perfect! Loling at your recap! MT. LOL, now I am picturing you picturing me! haha! LCT. I voted,are you able to vote more than once? Jan, always worth it, always. Emme,I think david would be great on a USO tour:) or whatever they call it now. haha.just remembered… when I was trying to get to where yvette was, the first section I tried to go down to crossover…..I got blocked by some “cheerleaders” in the aisle who started their cheer as I was trying to get past them. after a couple of brushes with their pom poms, I had to give up that aisle time wasted, seconds lost wheres David, I’m tellin’ ya..
Sky, love your recap! Lucky you, getting to see David again!!!! Glad you got so close and thank you for the lovely video. That voice!!!! Hey! 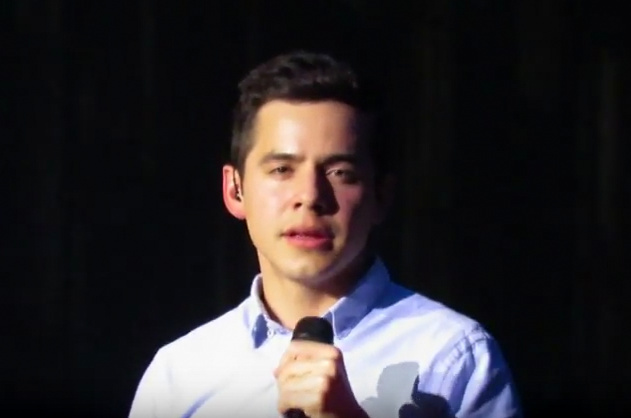 The thing is that I wanted to talk about David’s performance of God Bless America, why? Well, because it was frickin’ GOOD! And since I see you haven’t talk about it yet, I thought you would want to check it out! 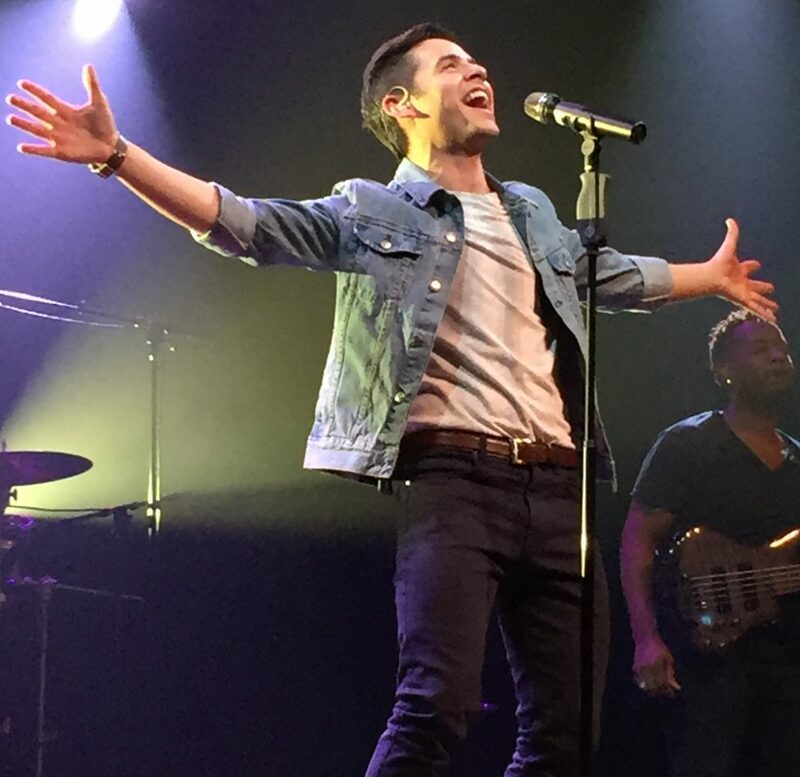 Anyways, just in case you want to check out my review (as well as the vid of David singing God Bless America), I will leave here the link of the post I did about David’s performance! I enjoyed your recap so much that I didn’t want it to end! I’m so glad you persevered in the heat and got to see David again. Thanks for the link to your review and video! 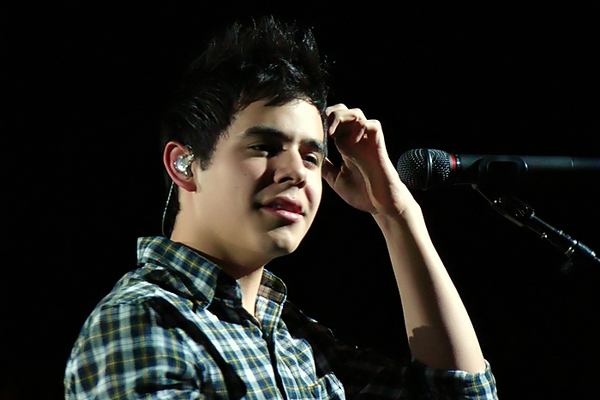 David’s performance of GBA was awesome! He makes us proud with every performance. He’s a master at singing patriotic songs! I also liked the place in that video where DA says that a big part of his def. of “longevity” is “providing for the fans”. I like my fanship provided for. Yes indeedy I do. “All fans on deck!” “Ship ahoy!” We are all members of the good ship DA. And he is the “Captain oh, Captain!” whose voice we hear sometimes above a storm. Watching him order and sail his own ship sometimes keeps me on course with my own. Okay… wandering brain here. Just meant to say Hi and thanks, Bebe. I appreciate you. Tons. sky, love your recap and I’m giggling at your day in the sun! I’m glad David is where it’s warm, he seems to prefer heat to cold (me too) and Utah is rainy and kind of cool right now. Wonder how many “bobbleheads ” there were at that game. Haha If you were in the outfield looking at the crowd–probably looked like you were all sitting down on tacks all the time. The pictures of him behind the wire made me think of ” to many barriers” — Did your daughter get to see who she wanted to see? Sky, thanks for the recap. You do not disappoint. Hilarious as usual. How pathetic is it that I find this behavior perfectly logical under the circumstances? Of course you made an initial sweep of the perimeter. Of course you scanned the entire stadium till you located his black head. Naturally your head began to bobble uncontrollably. Totally appropriate that you flew up the stairs because you saw him “behind those players! !” No self-respecting David fan would have done less my dear! So glad you got to meet him close up and say a few words of appreciation. You spoke for us all. He was great. Thanks for having the presence of mind and quick reflexes to obtain that superb audio of God Bless America. Mission accomplished! Bebe♥ I think I ended my recap comments as abruptly as my video attempt.HA! Thank you! I love your metaphors and analogies. for teens but for his older fans as well. He leads by example and his examples are inspiring for all ages. One of the many reasons we are so drawn to him. Hope your computer comes back soon. I don’t really like working on a laptop either unless it’s absolutely necessary.